You'll be £25.00 closer to your next £10.00 credit when you purchase Waterline Warships. What's this? Order within the next 8 hours, 20 minutes to get your order processed the next working day! Detailed colour illustration, with much to admire and learn from. A practical book, useful and interesting for fans of the most advanced Naval Modelismo. This is a book well worth buying for anyone interested in making models using relatively simple methods – from age six to eighty. The author is a superb miniaturist. An outstanding book written by a master, beautifully produced and illustrated with detail photos and crisp, clear text. The photographs in this book are sure to inspire any modeller - whether scratchbuilding or assembling a kit...A book that should be added to the library of any serious model warship builder! 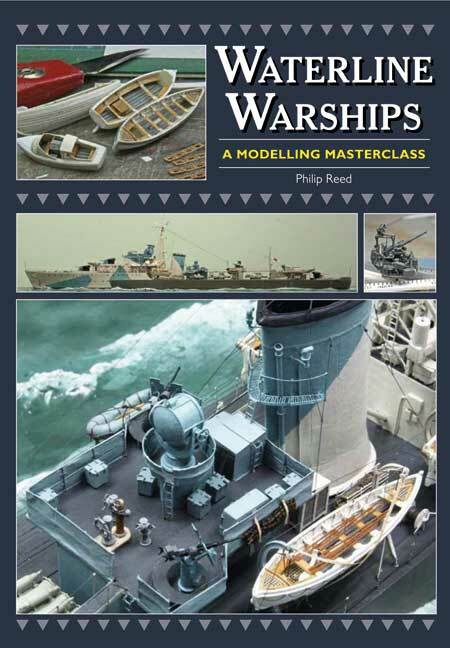 Written by the world's renowned modelmaker and shipwright, Phillip Reed, the book is an easy to follow manual on how to build from scratch models of several World War II warships, such as Ca Class destroyer HMS Caesar or the sistership of Cavalier. Every aspect of the process of the modelmaking is covered from the construction details to finishing touches such as camouflage, or application of ammunition and other accessories. The modelling experience presented in the guide guarantees a success in the attempt of model building. Philip Reed is probably the best known model shipwright, in this book he focuses on what has been the most popular of subjects for ship modelers, the warships of the Second World War. The sheer attention to detail bring an inhalation of breath. There are two lines of interest in this book, the first being the details of weapons, equipment, layout and appearance of class ships built between 1943 and 1945, there is a host of information printed and illustrated. The second line of interest in this well produced, well coloured and easy to follow book is to build model ships. It is so thorough, so complete and so interesting that for any competent workman it will provide many hours of joy. Many will find much interest and occupy in this superbly presented book. A beautifully produced book. Very well illustrated, with several hundred of the author's own excellent photographs (published in full colour throughout) of the model accompanying the text at every stage of building, this book is well worth having for enthusiasts of WWII warships and 20th Century warships in general for the visual interest of there illustrations alone. Both the in-build and finished appearance of individual parts or areas under discussion are clearly and profusely illustrated. Accompanying photographs on every page are concise but very informative written descriptions of the building procedures employed, at each stage of construction illustrated. The writer certainly does a very realistic job on the sea, that difficult aspect of waterline modelling. Both texts and the photographs are full of inspirational ideas on how to produce everything from the hull to detailed fittings. These tips too are well worth the investment. A book worthy of a place on any modeller's library shelves. Philip Reed, best known for his superb models of ships from the age of sail, here turns his attention the other highly popular subject for ship modelers - the war ships of the Second World War. The book is a step-by-step manual for building a scratch waterline model of the CA class destroyer HMS Caesar, the sistership of Cavalier now on display in Drydock at Chatham Historical Dockyard. The model presented in the book is built to scale of the 16ft to the inch and is designed to be displayed as a waterline model in diorama. Every aspect is covered from the construction of a bread and butter hull through to the details of camouflage, bridge, funnel, mast the 4.5in, Hazemayer and Oerlikon guns, boats, davits, depth charge gear, torpedo tubes, searchlights, vents and lockers... and the sea itself. Philip Reed, reowned model shipwright creates a step-by-step manual for building WWII warships. All images are in colour and of good size with detailed captioning for each which makes this worthy of having on the bookshelf if you are into Naval scratch and shipbuilding of the larger scales. This book is a detailed description of the construction of a 1:192 scale waterline model of the 1944 destroyer HMS Caeser as built. Philip Reed is a professional modelmaker who trained in Fine Art and this background has been put to good use in constructing a model which exhibits those little artistic touches which bring it to life. This book should find a place on the bookshelf of anyone contemplating building a model of this type as the construction techniques and many of the fittings described are equally applicable to other vessels of the period. This is very easy to follow, step-by-step manual for building a scratch waterline model of the Ca Class destroyer HMS Caesar. The sistership of Cavalier, Caesar was an emergency built WWII warship that saw action in 1944 on the Russian convoys and also in defence of the Western Approaches. Aided by this book, the amateur enthusiast will be fully equipped to build him or herself an impressively detailed and authentic 16ft to 1in scale model, designed for proud display in a diorama. Philip Reed is a world-renowned model shipwright with more than fifty years of experience, so his authorship is a sure guarantee of the quality of this guide and the resulting model. Every tiny aspect of building a replica ship is covered, from the final paintwork to the design of the torpedo tubes – you won’t believe the amount of detail provided! 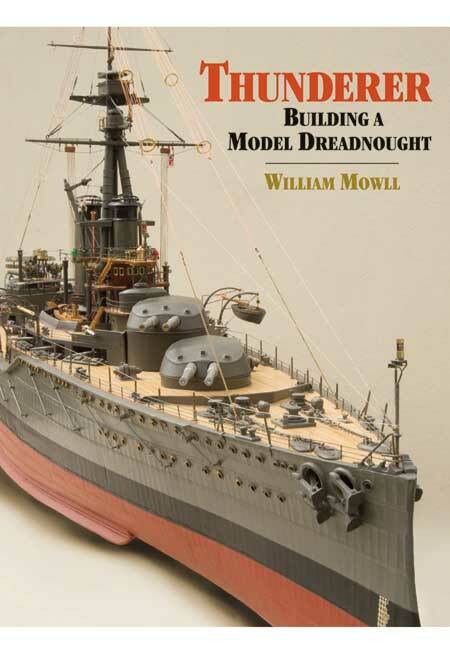 Also included is a stunning ‘Model Gallery’ featuring pictures and background information on some of the author’s previous models, including the revolutionary WWI ship HMS Dreadnought. The book is clearly presented, concisely written and very easy to understand. Lavishly illustrated with a multitude of high quality colour photographs, it is a foolproof guide that will enable the reader to complete a thoroughly enjoyable and satisfying project and produce a striking model warship. Phil Reed is a professional model maker who has built models for clients in North America and Europe. His work also includes restoration projects for leading galleries and museums. After studying Fine Art and Photography he found his true vocation in ship model building, eventually abandoning a teaching career to concentrate full time on his model work. His latest work, Building a Miniature Navy Board Model, gives readers a step by step guide to creating these magnificent models.